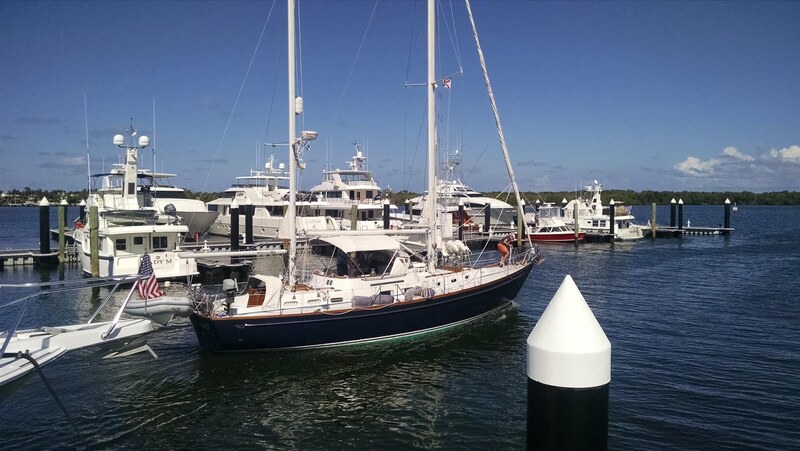 After slogging up the ICW “ditch” from Fort Lauderdale to North Palm Beach we settled in for some relaxation over the weekend and began lining up our needed maintenance appointments with our local experts. 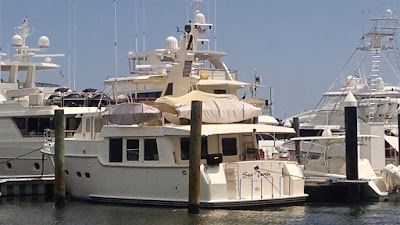 On Tuesday Yacht Tech arranged for Alex Graham, our diesel engine guru, to come out to the boat the day after he returned from vacation, and we appreciated the prompt attention. After examining the leak points and patterns around the main engine’s oil pan gasket, Alex agreed that we needed to pull the pan off and install a new gasket. Later that day he confirmed he had the gasket part in stock and would be out the next day to attack it. That meant that Rick had to drain the oil; it was a bit early for an oil change (not due for another 60 hours) but it would be worth it to resolve this annoying oil pan leak. 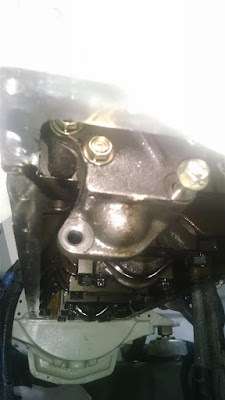 On Wednesday we spent most of the day in the engine room….got the pan dropped and the old gasket removed: it looked pretty gnarly, probably a combination of insufficient adhesive in some places, then overtightening that had malformed it further. Alex wasn’t happy with some of the uneven surfaces on the oil pan lip, so he removed the fan belt housings at the front end of the engine, slid the oil pan out from under, and then sanded the rim to bare metal. Then an even coating of Permatex was applied along with the new gasket. By late afternoon the job was done and Rick then tackled installing the new oil filter and filling the engine with 6.2 gallons of fresh oil. But we did not run the engine yet….the gasket sealant needed to cure overnight. So it wasn’t until Thursday morning at 0900 that Rick fired up the main engine and ran it for a full hour at varying RPM settings. Alex was back aboard shortly after 1000 to make a visual check of his handiwork. All the new absorbent pads were still pure white, and we could find no seepage anywhere around the new oil pan gasket. That certainly was all good news – oh yeah, and done under warranty – although we would need a final leak check when we got the next opportunity to run the engine under a load while underway. That would come several days later when we were scheduled to sortie out to take on fuel. Next up was for us to get a diver out to clean the boat below the waterline and check all the sacrificial anodes. That’s typically a monthly event, and we wanted a slick hull before setting off for the islands. Mark from Treasure Coast Diving made time in his busy schedule to dive the boat on Friday afternoon and after a couple hours of underwater work pronounced the hull, bottom paint and anodes all in good shape. Shortly after that our friends from Stabilized Marine (Ray and Dillon) came to the boat to asses our stabilizer issues. They believed the melted grease leak on the pump to be a result of overfilling with grease, with the recommendation to keep running it, mopping up the residue occasionally, and waiting for the excess grease to basically burn off. But the oil leak on the starboard side actuator would require replacing its feedback valve – again. We’d had that done once before about six months ago. We got on their schedule to return with the part and replace it early the following week. During this layover interval we also had the opportunity to make new friends. A few days after we arrived, another Nordhavn, an N47 named Mari Mi, pulled in to OPC just a few slips down from us. We introduced ourselves to Mike and Mari Zimet who had just returned from six weeks cruising in the Bahamas – coincidentally along a path through the Abacos nearly identical to the one we were in the midst of planning. Mike and Mari were an absolute treasure trove of hugely helpful tips and information. And since Mike also runs a Nobeltec navigation system on his boat, we took the opportunity to export all his tracks to a USB stick and uploaded those to our nav system. Now that’s good some intel to have given how skinny the depth can be over there. To return the favor Rick spent some time aboard Mari Mi to help Mike with some outboard engine maintenance, a wing engine oil change, and installing some new Racor fuel filters. As a bonus we also were introduced by Mike and Mari to their OPC Marina next door neighbors, Paul and Kris Hickey, aboard their 49 foot Hinckley sailing ketch Irish Tango. They had been buddy-boating together while over in the Abacos. Of course we also ended up doing a progressive happy hour, going from boat to boat for snacks, drinks and tours. Good times and good people. 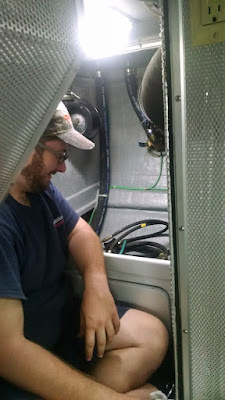 While we were in “pause mode” waiting on the stabilizer maintenance Rick attacked a few of our minor punch list items, mainly to keep that list from getting too lengthy. 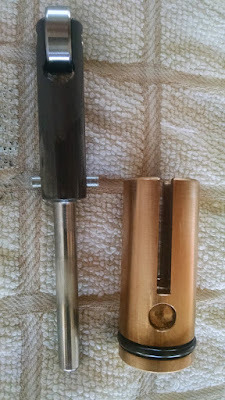 That included removing and re-bedding a loose upper hinge on the starboard side boarding door; a healthy shot of the Rescue Bond XL1 caulk and some oversized stainless screws seemed to do the job. We had also previously experienced a failure of some of the boat’s old style fresh water inline shutoff valves (wouldn’t shut off) so Rick replaced a couple of those, and also spent some time recalibrating the boat’s fresh water tank gauges. the Damned Things Costs $550 (Part Only). 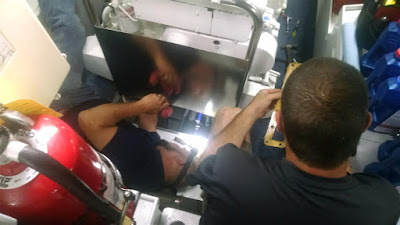 By Monday, 02-Apr, the techs from Stabilized Marine had located the needed part and a hole in their schedule to work on the starboard stabilizer’s feedback valve. While not a hugely complex task (for them at least), it requires quite a bit of disassembling caps, covers and hoses on the actuator; and accessing that damned thing is another story. Its compartment is tucked under the forward starboard alcove of the engine room, and to get under that we needed to remove a lot of gear normally stored there. You can’t be a big fellow to squeeze back there unless you’re willing to call the fire department for an extraction rescue when you’re done. A couple hours later the job was done, and the subsequent system tests at the dock looked good. It will be interesting to see how long this new feedback valve lasts, although we were informed that Naiad recently reduced their already lousy warranty on that part (which costs around $550 USD by the way) from 90 to 30 days; at this pace we might just have to get used to living with some leaks. It reminds us that fellow Nordy owner Dennis Fox once said the best way to practice for owning a complex trawler was to go to the nearest marina and start throwing hundred dollar bills into the water. On Tuesday, 03-Apr, we bid farewell to Mike and Mari (Mari Mi) and to Paul and Kris (Irish Tango.) Both were headed back north (in spite of the weather up there.) We hope to visit Mike and Mari in their home port of Oriental, North Carolina when we head that way ourselves later this year. Over the next few days Chelle also tended to her final knee treatments back in Fort Myers, and upon return the final provisioning of our fresh goods, while Rick kept up with the regular Wheelhouse maintenance items on the boat. And on Friday, 06-Apr, we took on 478 gallons of diesel, topping off our fuel tanks so that we wouldn’t have to pay Bahamian fuel prices should that need arise. 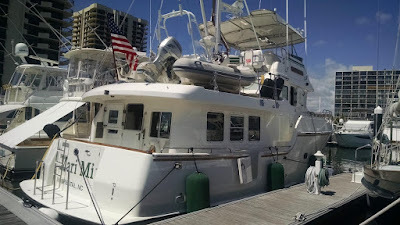 On Saturday, 07-Apr, we welcomed our good friend Michel Sirois and his wife Caroline back to the USA as they arrived at OPC aboard their Nordhavn 50, Sea Turtle. Michel was part of our crew when we crossed the Atlantic last year aboard N60 Relish, and it was great to hook up with him once again and catch up on his recent adventures in the Bahamas. At about the same time, our very close friends Dan and Juli Eisenberg drove over from their home in Englewood and joined us aboard Ghost Rider. 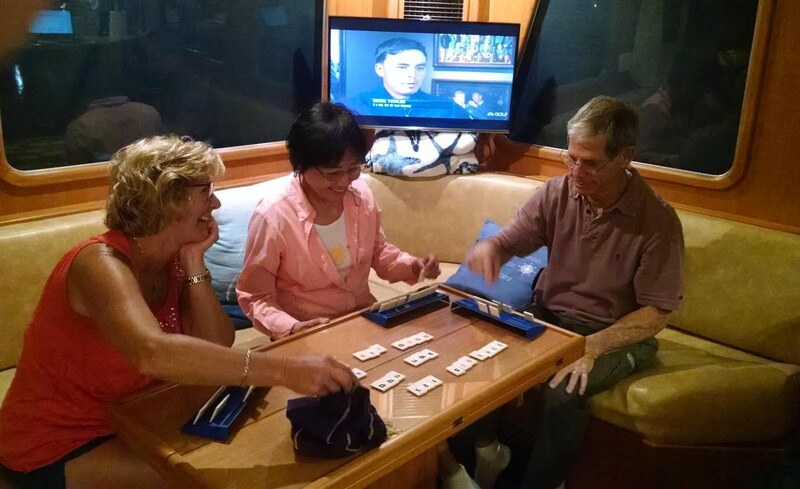 We got them settled into what would be their new “home” for the next 12 days as we cruised through the Abacos together. Now it was all about finding a weather window to cross the Gulf Stream. Originally we planned to depart Sunday morning for the West End Settlement on Grand Bahama, but the forecast was changing for the worse as of late Saturday, putting that plan in jeopardy….predicted sea states were getting rough and thunderstorms were starting to pop at both departure and destination points. Yet another late season cold front was plowing through the state from the north, triggering all sorts of unwelcome atmospheric activity. We’ll just have to remain ready to go as we closely monitor what seems to be a constantly changing forecast.